1 USF Sete Moinhos – ACES Oeste Sul – ARSLVT, Lisboa, Portugal. Background: Lithium is often used in bipolar disorder and occasionally in unipolar depression. Non-steroidal anti-inflammatory drugs (NSAIDs) and diuretics are frequently prescribed and their interaction with lithium is based mainly in few small studies. Objectives: Conduct a review, identify different interaction patterns and discuss treatment options. Methods: Three searches were made in PubMed in January 2016: 1) using the keywords “lithium” [and] “non-steroidal anti-inflammatory”; 2) using the keywords “lithium” [and] “diuretics” and the filter “title/abstract”; 3) using the terms “lithium” [and] “toxicity” and the filters “title” [and] “review”. From the 293 remaining articles, 10 were selected. Another search in Scielo.org was made, using the term “lítio” and the filter “Psiquiatria”. Two articles were selected from the initial 53. Six textbooks were added to expand the evidence, achieving a total of 18 references. Results: The majority of NSAIDs and diuretics rises lithium levels, specially thiazides. However, some show great variability or no interaction at all, and others even decrease lithium levels. Discussion: Lower-doses, shorter durations, lithium adjustments and levels’ follow-ups are recommended, especially in elderly and multiple co-morbid patients. Keywords: Lithium, non-steroidal anti-inflammatory drugs, diuretics, drug interactions, safety. Lithium is a mood stabilizer frequently used in bipolar disorder and occasionally in severe or recurrent unipolar depression, reducing also the risk of suicide. Non-steroidal anti-inflammatory drugs (NSAIDs) – for their analgesic, antipyretic and anti-inflammatory effects – and diuretics – for their blood pressure and edema reduction effects – are frequently prescribed, especially in the elderly, who are particularly susceptible to lithium’s toxicity1-11. The co-administration of this narrowed therapeutic window drug with NSAIDs and diuretics is common, but seldom mentioned. This issue is even more relevant due to the inexistence of robust studies focusing the myriad of possible interactions of lithium with the multiplicity of NSAIDs and diuretics that exist nowadays, with a significant part of the actual evidence coming from case studies and small clinical trials1-5,10,12. Therefore, this article intends to make a global review of the matter, having as main objectives to identify the different types of NSAID’s and diuretics’ interactions patterns with lithium and to propose treatment alternatives. Figure 1. Article selection flow chart. 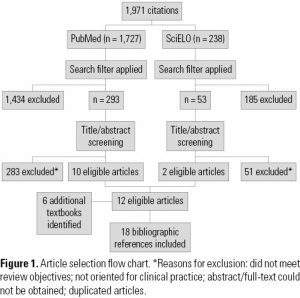 *Reasons for exclusion: did not meet review objectives; not oriented for clinical practice; abstract/full-text could not be obtained; duplicated articles. Three initial bibliographical searches were made in PubMed’s database, in January 2016. For the first one, the MeSH terms “lithium” [and] “non-steroidal anti-inflammatory” were used; for the second one were used the terms “lithium” [and] “diuretics” and then the filter “title/abstract” was applied to narrow the search; for the third one were used the terms “lithium” [and] “toxicity”, and then were also applied the filters “title” [and] “review”. Therefore, the searches resulted in 146, 123 and 24 articles correspondingly (n = 293), from which 10 articles were selected (6, 3 and 1 respectively), accordingly with the objectives of this review. Afterwards, but also in January 2016, an additional search in Scielo.org database was made, using the term “lítio”, resulting in 238 articles. To narrow the search, the filter “Psiquiatria” was applied and from this initial 53 articles’ pool, 2 were selected accordingly with the defined objectives. To expand the scientific evidence found, more sources were added through bibliographic review of 6 textbooks based on strong international scientific evidence, achieving a total of 18 bibliographic references for this critical literature review (Figure 1). Lithium is administrated in the form of lithium’s carbonate and its elimination is practically all processed by the kidneys (one half in ≈12h and the other one in 1-2 weeks). This explains why lithium blood measurements are done 4-5 days after the beginning of treatment and 12h after the last dose. About 80% of the lithium filtrate is reabsorbed (≈60% in the proximal tubule and ≈20% in the loop of Henle and collector duct)1,2,5,9-11. This way, medications that reduce the glomerular filtration rate (like NSAIDs and hypertension drugs that interfere with the renin-angiotensin-aldosterone system) or that stimulate lithium reabsorption (like NSAIDs and most diuretics) can contribute to lithium levels above the therapeutic window (0,5-1 mmol/L or 0,4-1,5 mmol/L, admitting an extreme interval)1,2,5,7-11,13. It’s well established that the NSAIDs inhibits prostaglandins’ synthesis by cyclogeneses blockage (COX1 and COX2), leading to two processes that can explain the rise of plasmatic lithium levels. On one hand, prostaglandins fall leads to the reduction of renal arteries’ flow by vasoconstriction, resulting in decreased glomerular filtrate and consequently decreased renal lithium clearance; on the other hand, theories postulate that low levels of prostaglandins can promote a direct rise in sodium and lithium, because lithium’s renal reabsorption is similar to sodium’s and because of the presence of several nephron proteins that promote both cations co-transportation1,5-9,11,12,14. The diuretics’ interaction however, differs from class to class. The majority promotes a rise in sodium renal excretion, conditioning a decreased concentration of it and therefore the activation of a compensatory mechanism of increased sodium tubular reabsorption and, as explained, also of lithium. Situations linked to hypovolemia and hyponatremia can also lead to lithium rises by the same mechanism1,4-6,8,10,11,15,16. Although, diuretics’ effects differ according to the nephron’s site of action of each drug class. Thiazides and similar produce and increase in sodium and lithium reabsorption in the proximal convoluted tubule (where their reabsorption is more relevant). Loop diuretics (like furosemide) act mainly in the loop of Henle (where lithium reabsorption is marginal). Differently, osmotic diuretics (like mannitol) and carbonic anhydrase inhibitors (like acetazolamide) increase lithium clearance and consequently diminish lithium levels1,3-6,10. Common secondary effects (that occur in non-toxic therapeutic doses) can be distinguished from toxic effects (for lithium levels > 1,5 mmol/L)1,10,11. The secondary effects can happen in a short or in a long term. At a short term are frequent: nausea, vomits, diarrhea, tremor and in some cases, ataxia, sedation and cognitive impairment. The most frequent long-term effects are: alopecia, acne, hypothyroidism, hyperparathyroidism, weight gain, polyuria, polydipsia (due to nephrogenic diabetes insipidus) and chronic renal insufficiency (mainly due to interstitial nephritis)1,3,5,9-11. Several risk factors for intoxication are already identified like: old age, drugs (diuretics, NSAIDs), renal insufficiency, renal artery stenosis, hyponatremic and hypovolemic conditions (cirrhosis, cardiac congestive heart failure, nephrotic syndrome, dehydration and low-salt diets) and overdose. Interindividual susceptibility and changes in lithium levels can therefore lead to several adverse effects, described in Table 11,3,5,10,11,13. Therefore, is vital to closely check the lithium levels until stable values are achieved, for instance weekly. Afterwards, a 6-month check is recommended for lithium levels and renal and thyroid functions. Metabolic control (weight, cholesterol and glycaemia) as well as the cardiac function should also be checked more frequently3,9-11. The majority of NSAIDs (including COX-2 selective inhibitors) show moderate risk for increasing plasmatic lithium concentrations. This risk is higher for high doses and long-term treatments. Normally, the interaction occurs in the first days of co-administration, despite the description of interaction months later in some cases6,8,11,17. Even admitting a class effect, they are still unknown mechanisms of interaction that can be the basis of some exceptions. Acetylsalicylic acid and sulindac are two of those examples without strong evidence of interaction. In other cases, there is a great interindividual variability, as accounts for ibuprofen and naproxen (Table 2). Despite the average increase in lithium levels with NSAIDs of 10%-25%, there are sporadic cases of 100% raise described1,3-8,12-14,17,18. Alternatives to NSAIDs for analgesic effect are paracetamol (acetaminophen) and opioids. For Paracetamol there is no evidence of interaction with lithium, but for opioids there is an increased risk for serotoninergic syndrome. Therefore, if there is a need for a NSAID in such cases, one could rather use: 1) acetylsalicylic acid or paracetamol (if analgesic or antipyretic effect is needed and there are no contraindications); 2) low-fixed dose or topic NSAIDs (theoretically less risky, but without studies corroborating that)1,2,5,6,12,14,18. – It should be avoided in high risk patients for lithium intoxication, especially in the elderly and renal insufficients6,10,11. The interaction pattern varies with the class of the diuretic and its corresponding pharmacokinetics. Disparity in sodium and lithium renal reabsorption’s site can explain why thiazides and analogs have a strong interaction pattern and loop diuretics and sparing-potassium diuretics don’t (Table 3)1,4-6,11,13,15,16. The report of interaction cases with thiazides have accumulated since the 70’s, particularly with hydrochlorothiazide and chlorthalidone. These diuretics promote a 25% increase in lithium levels (with some cases reporting up to 4-fold rise). This effect is commonly present in the first days of co-administration. Despite the interaction between lithium and most NSAIDs being so unpredictable, with thiazides that interaction is much more likely (being held as a high-risk interaction). So, its wise to discourage the use of such diuretics in lithium medicated patients1,4-6,11,13,16. For loop diuretics, the scientific evidence is somewhat conflicting. Although furosemide didn’t produce changes in lithium levels in some cases, in others seemed to be responsible for small plasmatic increases, especially in susceptible individuals. Also, furosemide’s interaction can occur a little bit latter than with thiazides, but usually in the first month. Despite all that, it is considered a safer diuretic than thiazides, being mentioned as a therapeutic option for nephrogenic diabetes insipidus secondary to chronic treatment with lithium1,4-6,11,13,15. For potassium-sparing diuretics, the evidence is even more scarce, with no interaction in most studies and small increases in lithium levels on other studies, apparently being amiloride the safest option in the class. Despite not being unanimous, these diuretics can configure an alternative to thiazides1,3,4,6. 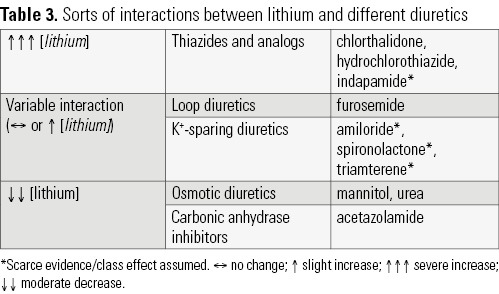 Osmotic diuretics (like mannitol) and carbonic anhydrase inhibitors (like acetazolamide) produce an opposite effect comparing to the majority of the other diuretics, decreasing lithium concentration (being therefore classically used to treat lithium’s intoxication). Globally, these drugs are not recommended in lithium treated patients, due to high risk for psychiatric unbalance3,4,6. However, there are several alternatives to diuretics for anti-hypertension effect, despite the evidence being based mostly on case-control and in class effect extrapolation. The angiotensin converting enzyme (ACE) inhibitors are not recommended because they lead to rises in lithium levels, the same being assumed for angiotensin II receptor antagonists. Calcium channel blockers – most cases mentioning verapamil – can increase sensibility to lithium toxic effects, even though decreases in lithium levels are described paradoxically. Despite β-blockers could decrease lithium’s clearance, they seem to be safer and are commonly prescribed to treat accessory effects of lithium (as the common use of propranolol for tremor)1,3,6,5,9,11,13. So, in the need of a hypotension effect in a patient already medicated with lithium is probably preferable to use a β-blocker (if no contraindication exists). If a diuretic effect is needed, one could use a loop diuretic (like furosemide) or a potassium-sparing diuretic (like amiloride or spironolactone). These can be administrated in a low-dose basis and following the same administration recommendations as for NSAIDs (with a different advised reduction of lithium dose of 25%-50%). Patients medicated with thiazides should suspend these drugs because of the high risk for lithium intoxication3-6,11. The majority of NSAIDs promote an increase in lithium levels and some, like Ibuprofen and Naproxen, show great interindividual variability. Acetylsalicylic acid doesn’t show evidence of lithium interaction. Diuretics also promote lithium increments, particularly thiazides, which can be explained by their main action in the proximal convoluted tubule, where lithium absorption is higher. Therefore, they should be replaced by loop and K+-sparing diuretics, despite the limited evidence for these diuretics. Inversely, osmotic and carbonic anhydrase inhibitors lead to a significant decrease of lithium levels. If it is impossible to remove some NSAIDs and diuretics, they should be used in a lower-dose and shorter duration as possible, with lithium dose adjustments and levels’ follow-ups. Elderly and multiple co-morbid patients are considered high risk patients. Despite these recommendations, more studies are needed to properly assess the probability and severity of these interactions, because an important part of evidence is based on few case studies and small clinical trials. Rosa AR, Kapczinski F, Oliva R, Stein A, Barros HMT. Monitoramento da adesão ao tratamento com lítio. Rev Psiquiatr Clín. 2006;33(5):249-61. Oruch R, Elderbi MA, Khattab HA, Pryme IF, Lund A. Lithium: a review of pharmacology, clinical uses, and toxicity. Eur J Pharmacol. 2014;740:464-73. Aprahamian I, Sousa RT, Valiengo LCL, Machado-Vieira R, Forlenza OV. 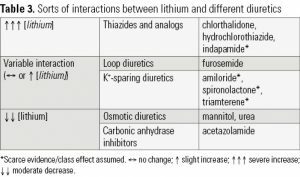 Lithium: a review of pharmacology, clinical uses, and toxicity. Rev Psiquiatr Clín. 2014;41(1):9-14. Finley PR, Warner MD, Peabody CA. Clinical relevance of drug interactions with lithium. Clin Pharmacokinet. 1995;29(3):172-91. Katzung BG, Masters S, Trevor A. Basic and clinical pharmacology. 12th ed. New York: McGraw Hill; 2009. Aronson JK. Meyler’s side effects of psychiatric drugs. Oxford, UK: Elsevier; 2009. Kelly CB, Cooper SJ. Toxic elevation of serum lithium concentration by non-steroidal anti-inflammatory drugs. Ulster Med J. 1991;60(2):240-2. Tonkin AL, Wing LMH. Interactions of non-steroidal anti-inflammatory drugs. Baillieres Clin Rheumatol. 1988;2(2):455-83. Infarmed. Prontuário Terapêutico – 11. Infarmed; 2012. Dale M, Haylett D. Rang & Dale’s Pharmacology. 7th ed. Edinburgh: Elsevier/Churchill Livingstone; 2011. Taylor D, Paton C, Kapur S. The Maudsley Prescribing Guidelines in Psychiatry. 12th ed. London: Wiley-Blackwell; 2015. Monji A, Maekawa T, Miura T, Nishi D, Horikawa H, Nakagawa Y, et al. Interactions between lithium and non-steroidal antiinflammatory drugs. Clin Neuropharmacol. 2002;25(5):241-2. Mozayani A, Raymon LP. Handbook of drug interactions: a clinical and forensic guide. New York: Humana Press; 2004. Ragheb M. The clinical significance of lithium-nonsteroidal anti-inflammatory drug interactions. J Clin Psychopharmacol. 1990;10(5):350-4. Laville M. Loop diuretics and angiotensin-converting enzyme inhibitors increased risk for hospitalization for lithium toxicity. ACP J Club. 2005;142(1):25. Berkowitz HL. Thiazide diuretics and lithium levels. J Clin Psychiatry. 2001;62(1):57. Phelan KM, Mosholder AD, Lu S. Lithium interaction with the cyclooxygenase 2 inhibitors rofecoxib and celecoxib and other nonsteroidal anti-inflammatory drugs. J Clin Psychiatry. 2003;64(11):1328-34. Danion JM, Schmidt M, Welsch M, Imbs JL, Singer L. [Interaction between non-steroidal anti-inflammatory agents and lithium salts]. Encephale. 1987;13(4):255-60.